Our range of products include square shape counter flow cooling tower. 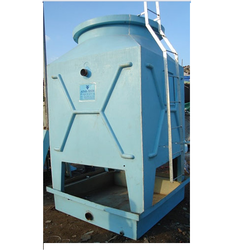 We are considered as a specialist in offering a wide range of Counter Flow Cooling Tower-Square Shape. These work on the induced draft counter flow principle operation. In these towers, the fan vertically creates an air movement across the tower which is filled in opposition to the water flow. As water distribution is even, hot circulating water enters the water inlet headers and sprays through a nonclogging polypropylene spray nozzles. In addition, to reduce drift losses, these towers are fitted with well-designed PVC drift eliminators. For easy access to inspection and maintenance, these towers are also available with an inspection door. Apart from this, our range of FRP square type cooling tower can also be installed in mufti cell. Looking for FRP Square Shaped Cooling Tower ?